I think we can all agree that Pablo Picasso knew a thing or two about success. I think it’s safe to say he’s onto something here. 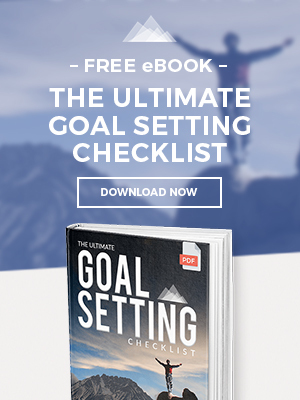 Goal setting is one of those skills often overlooked because it’s taken for granted. Do you want to achieve success? ‘Well, you can do anything you set your mind to.’ While I believe and endorse this very mantra, it’s just not that simple. Efficient goal setting is responsible for your motivation, focus, navigation, and the quality of your performance. When done correctly, it allows us to properly analyze the exact resources and skills we’ll need to accomplish the task, how many waypoints (target goals that lead to the ultimate goal) we’ll have to hit along the way and the timeframe in which we’ll do it in. This is why goal-setting is one of the four mental toughness principles taught to Navy SEALS. It’s the skill that allows us to become the architects of our own vision and draw a blueprint for our success. In mastering the art of goal-setting, being that you can identify every intricacy needed to achieve what you desire (and allow wiggle room for synchronicity), you enhance your performance in obtaining it. However, first, you have to understand the structure of goal-setting before it can improve the efficiency in your path to success. In my Unbeatable Mind program, I place goals into two different categories; ‘being’ goals and ‘doing’ goals. Being goals are the type directly responsible for the development of personal attributes. Doing goals are the skills, knowledge, and materials you want to obtain in your ‘final’ achievement. A doing goal could be getting yourself out of credit card debt. But beneath that doing goal exists a list of being goals that will need to be achieved as well; for example: improve your leadership, improve your work ethic, find ways to generate supplemental income, work towards bettering your skills so that you’re worth more in x position, improve your financial management, etc. Once you can discern the difference between the two types of goals, I recommend using the SMART-P system approach. Once this approach is spelled out, it is easier to understand how it affects performance. Measurable: what goals can you set along the way that will act as waypoints toward your success? How can you create a reasonable paradigm that manages progress? Achievable: with your current skillset and resources, can you achieve this goal simply by working towards it? If not, what skillset do you need to develop and what resources do you need beforehand? Relevant: how does this goal fit into the purpose you see for yourself? Does it fit within your overall objectives? Time-bound: how can you create a timeframe that finds the healthy balance between motivation and discipline? What frequencies can you add in that will guide you forward? Positively Stated: make sure your goal is charged only by positive words. ‘Try and get into medical school’ doesn’t work. ‘Begin my route into medical school’… that does. So How Does This Affect Your Performance? I think just by viewing the above, you can deduce how this would make you more efficient and dexterous in your conquest. But let’s process them individually. By being more specific, you have a clearer vision of your success, which means the route to achieving your goal will be easier to obtain. The more roads you can identify that take you where you want to go, the better you’ll be at navigating there. By creating waypoints, you allow yourself a measurement tool for your own success. This will help with motivation, progress management, and scope. By knowing the achievability of your desire, you can manage your expectations in succeeding. Some goals are going to be larger and more difficult than others. Arming yourself with this knowledge will help you be better prepared. By discerning whether or not the goal is relevant to your overall objectives, you know whether or not it’s an appropriate choice. Even if I’m high-performing in a task that is irrelevant to my overall objective, then I reduce my performance in achieving my ultimate goal. By creating a timeframe, I’m motivated to work faster and manage my time with meticulousness. Deadlines help propel your actions forward and keep you on task. By remaining positively stated, I remove doubt and fear from the conquest. In this, I am then more focused, calm, and creative in dealing with it. Think of goal-setting as mapping out the future. Instead of just drawing a line between you and that ‘ultimate achievement,’ you’re creating a freeway with multiple stops, waypoints, and gas stations that are all going to lead you forward. In doing this, you create order out of entropy, and you improve your performance in obtaining your goal… because now you can see it through a clear lens, while before the glass was cracked.